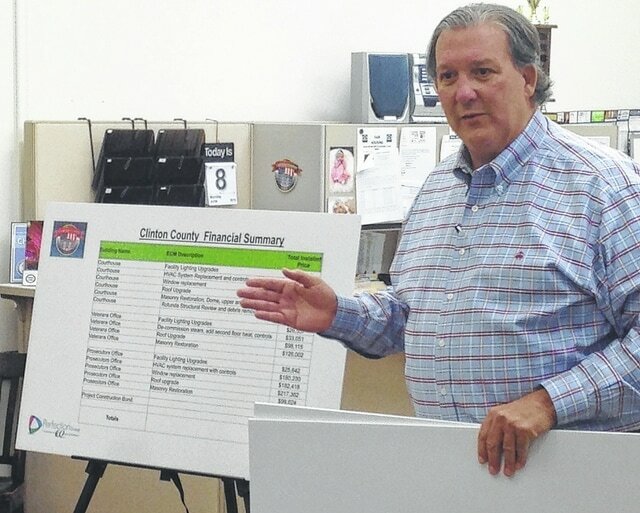 Tony Apro, president of Perfection Group, presents the cost of renovations to three county-owned buildings in this photo taken Monday. The Clinton County commissioners are considering renovating the courthouse, prosecutor’s office and Veterans’ Service Commission’s office. WILMINGTON — The Clinton County commissioners further discussed a recent $5.2 million proposal by Perfection Group to renovate the Clinton County courthouse, prosecutor’s office and Veterans’ Service Commission’s office. The commissioners each supported the project, though they didn’t vote on the matter. “Based on the severity and the work that needs to be completed, we can’t wait any longer,” said Commissioner Kerry Steed. “There are bits and pieces that we could put in a different phase, but the increased cost you would see by waiting and/or the mobilization costs to get a crew here” wouldn’t be worth it, said Commissioner Mike Curry. The project, if approved as presented, would include roof work, lighting upgrades and masonry restoration at all three locations, including the dome of the courthouse. Heat would be added to the second floor of the Veteran’s Service Commission’s office, and the courthouse and prosecutor’s office would have windows and HVAC systems replaced. Steed asked if Haley and Curry would consider financing the project, despite having enough money to pay it outright. That way, he said, the county could earn interest from the capital. Clinton County has $1.4 million in its capital improvements fund, and, according to Curry, has more than $5 million in money from the sale of Clinton Memorial Hospital. The money from the sale of the hospital is not the same as the wind-down funds the commissioners intend to invest with the Clinton County Foundation, as previously reported. With money from the sale of CMH, the county could pay for the renovations outright, if the commissioners wanted to, but Steed said the investment climate could change positively for the county, according to Morgan Stanley, which advises the county’s investment committee. “I think the possibility of at least ten years of the potential of upsides in a favorable investment climate is much greater than it would be if we just wrote a check right now,” Steed said. The commissioners scheduled a meeting with their agent at Morgan Stanley to see if financing it and investing the saved money over those years would be financially wise. Also on the project, County Administrator Mary Ann Foland said Perfection Group would be responsible for ensuring the work zone is safe. Steed asked the other commissioners and Foland if any of the buildings should be prioritized. Foland said no, pointing out that while the courthouse holds the most offices, the prosecutor’s office has had to close due to HVAC and water penetration issues. At Monday’s meeting, Clinton County Prosecutor said the basement flooded too badly to use. Curry asked Foland to find out if Perfection’s proposal, which included window replacements, included the arch windows in the courthouse’s rotunda. • Received a quarterly report and an annual report from Council on Aging of Southwestern Ohio CEO Suzanne Berke and Vice President of program operations Ken Wilson. The reports showed, on average, a decreased cost per client of $286.66, more seniors receiving home care assistance and medical transportation and fewer receiving home-delivered meals. Also, the waiting list was eliminated, and $130,000 was saved over five years through competitive bidding. Berke also presented the commissions with a $10,868 check. She said COA initially charged $82,300 because it was 6 percent of all expenses. As expenses decreased, COA only wanted 6 percent of the expenses, so it remitted the $10,868 to the county. She asked that the contract be amended to call for a 6 percent administrative fee instead of the $82,300 flat fee. According to records in the U.S. District Court Southern District of Ohio, a settlement conference was held in February, confidential terms were set and an order of dismissal was entered. In that order, Judge Timothy S. Black retained the right to enforce the terms. Community Action sued COA, claiming it was no longer providing meals to elderly residents who should receive them. COA claimed those people were not eligible to benefit from the home-delivered meals, also known as Meals on Wheels. • Received a report from Taylor Stuckert, executive director of the Clinton County Regional Planning Commission, who presented Wilmington’s 2015 comprehensive plan and township land use plans for several townships. Stuckert said the land use plans mostly reflect the townships as they are and can be changed if development is proposed. He also said he hopes to draft a Clinton County comprehensive plan soon.